We weren’t sure how much we would use a topper for our California or if we even needed one so I decided to have a go at making one, below is a guide to what I have done and a template if you want to have a go at making one for yourself. We ordered 20 Meters of black waterproof nylon fabric from eBay, you could get away with 10-12 Meters but I wanted some extra for mistakes and also to make some bags. I took some measurements and came up with the template below, this is the final size you need. You need to add about 15mm all round for the stitching joints and the hems. The tie downs are created with a loop of webbing sewn to each corner, 2 evenly spaced webs at the sides, I also put tabs in the centre at the front and back that have never been used. Onto these tabs I tied into a small loop of 3mm elasticated bungee material . To fix the top down I made some stainless steel plates with a 5mm stud welded to it. 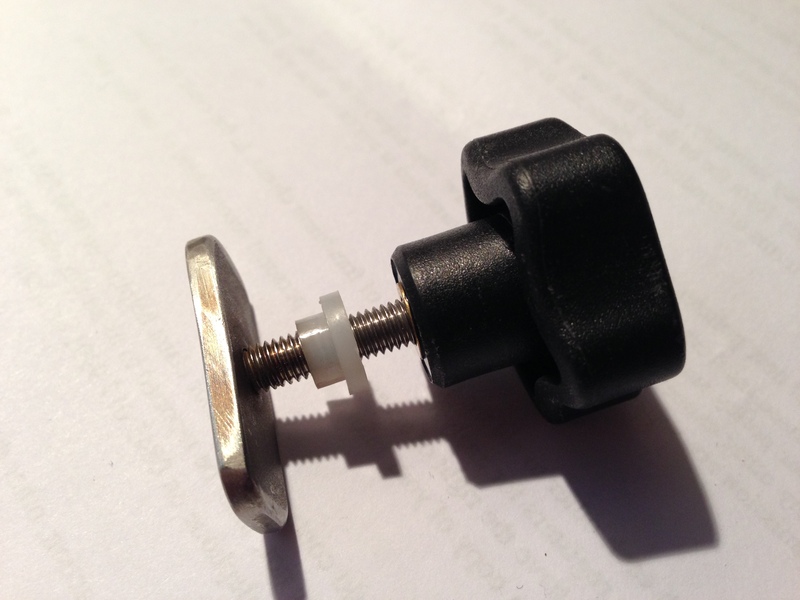 You’ll also need some nylon washers and a threadded knob, I got mine from RS components, part number 178-792, five 5mm knobs part number 448-8549. I Just slide the fixings along the rail and lightly tighten them. 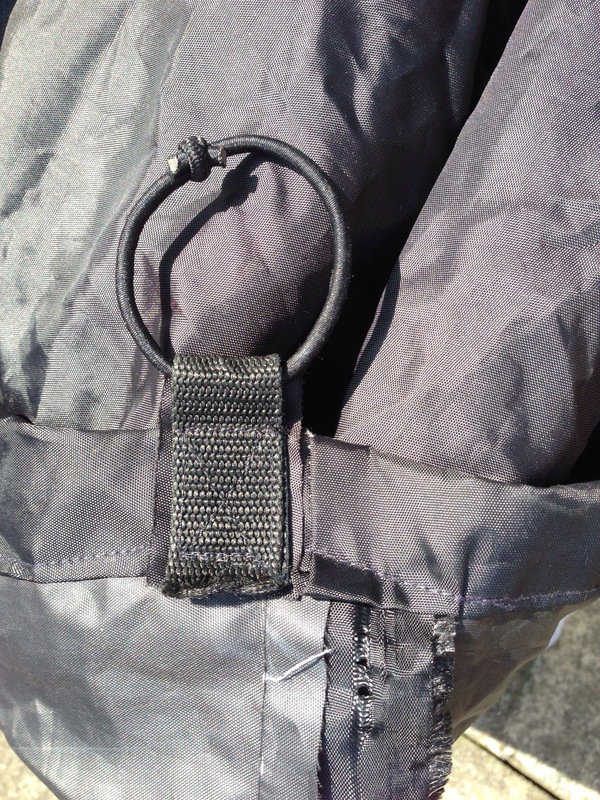 To secure the topper on the awning side I have used a log piece of elastic threaded through both loops of webbing on the awning side thats just stretched over. 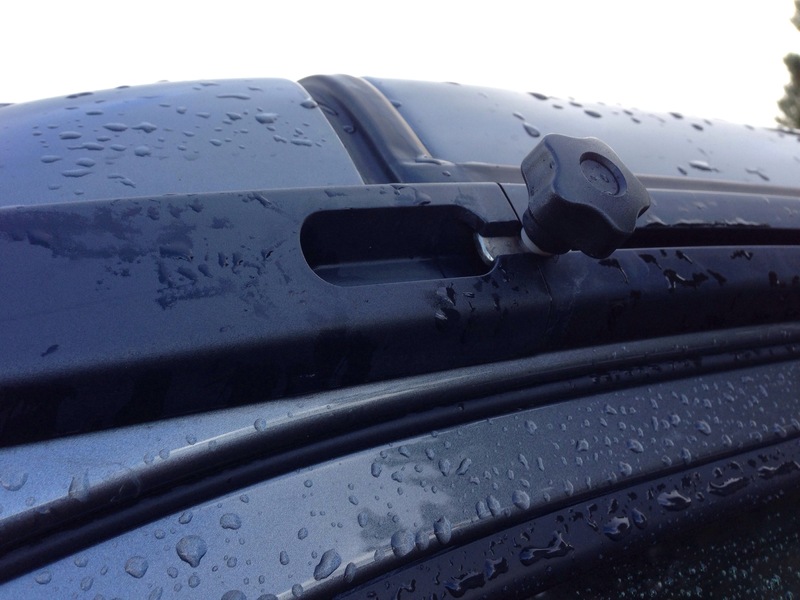 We only use the topper if its forecast to be heavy rain or rain with a strong wind and have not missed being able to see out of the windows, in the 4 years of owning a California we have only used it a hand full of times and it spends most of its life rolled up stowed away under the drivers seat. Total cost about £35, If you need and more information please ask. 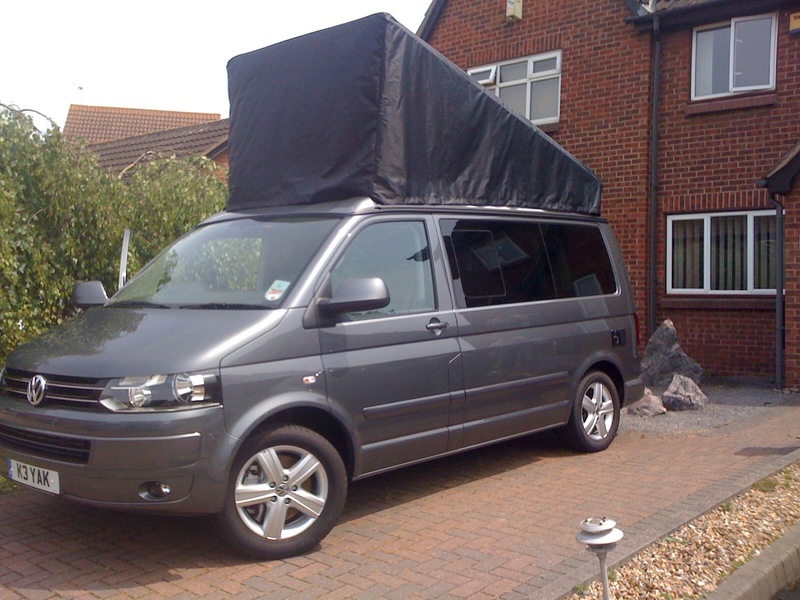 This entry was posted in VW California and tagged cali cap, DIY VW California roof cover, mutze, vanorack, vw California, VW T5 California by Jamie. Bookmark the permalink. Hiya, that is brilliant! Would you consider making another one for me if I paid you for the making as well as the material costs? Hi Michelle, I would be happy to make you one but just don’t have the time at the moment. It really is easy all you need is a sewing machine. Vraiment extra ! J’hésitais à le faire moi-m^me mais vous m’avez convaincu ! Le fiston kayakiste également est ravi ! Where did you find the nylon as cheap? I can’t find it on ebay. It was end of roll if I remember correctly and we were the only bidder. Thanks for this great description. I want to make me one. Do you remember what thickness of the cloth you used?? I can find ripstop nylon between 64 and 112 gr/m2. I link we used about 112gsm. thanks for all the job pre-done ! do you think that the sizes are the same for a T6 ? merci pour le travail que vous avez fait et qui va me faire gagner beaucoup de temps (patron). Pensez vous que les dimensions soient les mêmes pour un T6 ? I’m fairly sure the T5 and T6 size will be the same. Thanks a lot for your description. I just sew me one and it fits perfect. At both side I integrated one zipper horizontally so i can get some fresh air inside. Many thanks!